Entertaining outdoors is a favourite pass-time for most of us, but sooner or later, that Great British nip of cold weather always kicks in. Patio heaters keep the party going, giving off light and most importantly, a warming glow that will keep you and your guests feeling nice and toasty. The heaters are wall mountable, or free standing varieties are available should you wish to move it around or put it away for storage. They are powered electrically, meaning you won't have to run out to fetch gas or charcoal. 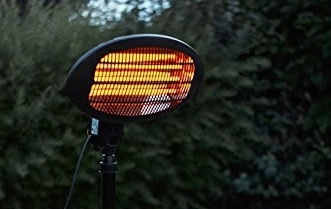 Treat your garden and your guests to a warming electric patio heater today. Speak with a Garden4Less expert today about our range of patio heaters.